Identification of urinary biomarkers for detection of bladder cancer recurrence would be beneficial to minimize the frequency of cystoscopy. Our objective was to determine the usability of urine content of mRNA in the detection and prediction of bladder cancer recurrence. We analyzed 123 prospectively cross-sectional collected urine samples from 117 patients with bladder cancer (12 incident cancers and 111 control visits). We used biopsies from cystoscopies as diagnostic criteria for recurrence, and followed the patients for a median time of 28.5 months (range 0-44 months). We measured the levels of hTERT, SENP1, PPP1CA, and MCM5 mRNA in urine by q-RT- PCR. We found significant differences in urinary content of hTERT (p < 0.001), SENP1 (p < 0.001), MCM5 (p < 0.001), and PPP1CA (p < 0.001) transcripts, when comparing urine samples from patients with and without tumor present in the bladder. We obtained sensitivity and specificity values for hTERT: 63/73, SENP1: 56/78, MCM5: 63/66, and PPP1CA: 69/63, respectively. Including follow-up data resulted in sensitivity and specificity values for hTERT: 62/84, SENP1:53/84, MCM5: 61/73, and PPP1CA: 65/66. Interestingly, at non-tumor visits the urinary content of especially hTERT (p = 0.0001) and MCM5 (p = 0.02) were significantly associated with subsequent tumour recurrence. Combining the markers with cytology improved the detection. The best combination was hTERT and cytology with a sensitivity of 71% and a specificity of 86% after follow-up. Further prospective validation or registration studies needs to be carried out before clinical use. We could use the urinary content of hTERT, SENP1, PPP1CA, and MCM5 to detect bladder cancer recurrence. All markers showed a higher sensitivity than cytology. The detection rate improved when including cytology results, but also the combination of hTERT and MCM5 increased the detection rate. Furthermore, hTERT and MCM5 levels predicted subsequent tumor recurrences. Non-muscle invasive bladder cancer is characterized by frequent tumor recurrences. Today the standard follow-up consists of cystoscopy combined with cytological examination at an interval of 3 to 6 months depending on tumor malignancy and previous recurrence rate. Cystoscopic examinations are unpleasant, time consuming, expensive, and may have serious side effects such as infections and damage to urethra . Cytology is characterized by a high specificity (0.83-0.997) but a low sensitivity (0.20-0.53) . It has been calculated that bladder cancer invokes the highest cost per patient from diagnosis to death; in the US calculated to exceed 3.4 billion dollars annually . Bladder tumor markers may reduce these costs significantly. Current FDA approved assays available for bladder cancer detection are: BTA stat, BTA TRAK, NMP22, FDP, Urovysion, and ImmunoCyt. One of the best characterized and more promising biomarkers is telomerase (hTERT) [4–8]. hTERT is a ribonucleoprotein enzyme that maintains telomeric repeats at the end of the chromosomes in order to compensate for sequence loss during DNA replication . Telomerase is inactive in mature cells, however, telomerase activity can be detected in 85-90% of all primary human cancers  and reactivation immortalize cells [10–12]. hTERT is described as superior to cytology in regard to sensitivity, but false positive results are seen in benign urothelial conditions [2, 7]. Other potential biomarkers like MCM5, PPP1CA, and SENP1 are less thoroughly described. MCM5 drives the formation of pre-replicative complexes in the first key event during G1 phase and is essential for cell proliferation. MCM5 is detectable in urine and associated with adverse outcome [13, 14]. PPP1CA is involved in pRB dephosphorylation [15, 16] and ceramide accumulation induced by RAS, as a response to oncogenic stress increases PPP1CA activity, pRB phosphorylation and onset of p53 induced arrest, and thereby contributes to tumor suppression [15, 16]. SENP1 is a SUMO-specific peptidase shown to desumorylate promyelocytic leukemia (PML) protein . PML protein is a tumor suppressor protein requiring SUMOylation [18, 19]. PML bodies of an altered morphology have been described in alternative lengthening of telomeres (ALT) . SENP1 might function as a marker for tumors in which telomeres were maintained by ALT, as not all, especially invasive tumors, are hTERT positive . Here we evaluated the diagnostic value of measuring the urinary content of hTERT, MCM5, PPP1CA, and SENP1 mRNAs for detection of tumor recurrence. Urine samples were collected prospectively at the Department of Urology at Aarhus University Hospital, Skejby. Informed consent was obtained from all patients involved, and the protocol was approved by the Scientific Ethics Committee in Aarhus County. We collected 50 mL urine at regular follow-up visits. All patients diagnosed with bladder cancer were included in the study. In total urine samples from: 54 patients with biopsy proven recurrent bladder cancer at sampling, 59 patients with a previous bladder cancer and no tumor at sampling, and 10 patients with a primary bladder cancer at sampling time. The tumor biopsies were graded according to Bergkvist (Table 1). Twenty-two of the patients received Bacille Calmette-Guérin (BCG), two patients received Mitomycin (MMC), and six patients received radiotherapy (Table 2). Eleven urine specimens were from patients with muscle invasive tumors. * EORTC scores are only calculated for non-muscle invasive tumors. There are 51 urine samples in the non-muscle invasive recurrent group and 48 urine samples in the no-tumor group. In the initial analysis recurrence was defined by biopsy verified tumor. But since cystoscopy is not 100% sensitive, we also analyzed the data using combined criteria of either biopsy verified tumor in the bladder or atypical malignant cells grade 2 or 3 in the urine [1, 22] as recurrence. Furthermore, follow-up data on the patients was used to make a longitudinal analysis [1, 23]. In the statistical analysis we grouped recurrent cases together with the primary cases. In the data analysis we defined positive cytology as presence of atypical cells grade 2 or 3 in the urine (see Additional file 1) [24, 25]. 2 mL of EDTA were added within 15 minutes after urine voiding, and the urine was stored at 4°C for a maximum of two hours until further processing. Then the urine was centrifuged and washed with PBS twice and the cell pellet was lysed in RLT buffer from QIAGEN. Immediately after lysis the samples were stored at minus 80°C. RNA processing was performed using QIAshredder (QIAGEN) and thereafter extracted using the RNeasy mini kit (QIAGEN) and eluted in150 μL RNase free water and stored at minus 80°C. The RNA quality was assessed by use of Eukaryote Total RNA picochips (Agilent Technologies). We used Stata 10.0 statistical analysis software (Stata Corporation, College Station, TX, USA) for calculation of ROC curves, nonparametric Wilcoxon rank-sum and Kruskal- Wallis tests for differences in parameters, Log-rank tests for equality of survival function, and Kaplan-Meier survival plots. We collected 123 urine samples from 117 patients during a two year period. The median follow-up time was 28.5 months (range 0-44 months). Including the follow-up period, 77 patients showed tumor recurrence. When comparing the urine samples from primary visits, recurrent visits, and non-recurrent visits we did not find any significant differences in RNA quality, age of the patients, follow up time, nor in previous tumor characteristics (Table 2). Notably, we observed much higher RNA concentrations in primary cancers than in recurrent and non-recurrent cases (p = 0.0001), as well as differences in pellet-size (p = 0.021), in line with earlier studies [1, 22, 23]. The recurrence risk score for the non muscle-invasive tumors was calculated using EORTC risk tables . We used the previous tumor combined with a history of T1 and T2-4 as a reference to calculate a risk score for recurrence and progression. We found no differences in risk between patients with recurrence and those without recurrence using EORTC risk tables (Table 2). We performed quantitative RT-PCR to measure the transcript level of hTERT, PPP1CA, SENP1, and MCM5 in the urine samples. In the first approach we used the cystoscopy result as the gold standard for recurrence and classified the patients accordingly. After applying optimal cut-off points using ROC curves (examples shown in Figure 1), we observed the following sensitivity and specificity measures for the analyzed markers: hTERT (62.5% sensitivity, 72.9% specificity, p < 0.001); PPP1CA (68.8% sensitivity and 62.7% specificity, p < 0.001); SENP1 (56.3% sensitivity and 78% specificity, p < 0.001); and MCM5 (62.5% sensitivity and 65.9% specificity, p = 0.008). Cytology had a 48.3% sensitivity and 79.3% specificity, p = 0.002 (Table 3). We combined the markers with cytology in order to improve our test results and found that especially the combination of hTERT and cytology resulted in a sensitivity of 73.3% and a specificity of 74.1% (Table 3). hTERT and MCM5 ROC curves. A: ROC curve for hTERT in combination with cytology grade 2 or grade 3 atypical cells and follow-up information included in the classification. The area under the curve is 81%. B: ROC curve for MCM5 in combination with cytology grade 2 or grade 3 atypical cells and follow-up information included in the classification. * All atypical cells in the urine recorded as positive. ** One or both positive. *** If only hTERT was positive then the combined score was classified as negative. In the second approach we included follow-up information and we found that nine of the 16 tumors formerly classified as false positive turned out to be true positive, raising the specificity to 83.7% for hTERT (see Table 4). All patients with positive cytology were diagnosed with a tumor in the follow-up period. The median time from urine sampling to tumor diagnosis was 12.3 month for this group (range 3-23). Sensitivity and specificity of all markers using these criteria are listed in Additional file 3. The specificity and especially the sensitivity are higher than observed when only using tumor diagnosis based on cystoscopy information. Furthermore, when we stratified the dataset according to grade, we found a positive correlation between our markers and high grade (Additional file 4). * Positive cytology defined by atypical cells grade 2 or 3 in the urine. **Considered positive if either SENP1 or hTERT or both are positive. 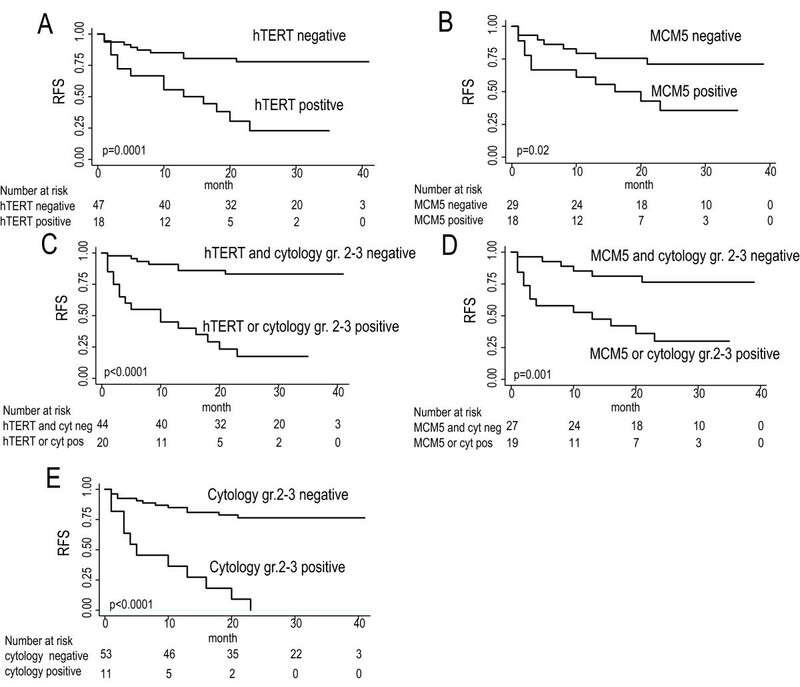 Interestingly hTERT, MCM5, and PPP1CA were positive in all 7 samples with atypical cells grade 2 or grade 3 that were diagnosed as non-recurrent because no tumors were found at cystoscopy; however, all were diagnosed with a tumor in the follow-up period. We also compared our results to cytology after stratifying the results according to grade using only cystoscopy as the diagnostic criteria. Again we found a positive correlation between grade and sensitivity for all markers and cytology (Additional file 4). The sensitivity was higher for all markers measured in the study compared to cytology, but the highest specificity was observed for cytology. For grade 1 and grade 2 tumors the markers were all superior to cytology. Combination of markers gave the best result for MCM5 and hTERT with a sensitivity of 76% and a specificity of 77% (Additional file 3). When applying a cut-off with one marker positive it gave a sensitivity of 72% and a specificity of 71%. AUC were 0.72 (Additional file 3). We evaluated the prognostic value of the markers at non-recurrent visits. We found that especially hTERT and MCM5 expression were able to significantly add information to the diagnosis obtained by cystoscopy and cytology as seen in Figure 2. The most significant difference was observed for hTERT, where 75% of patients who were hTERT positive without a tumor at cystoscopy recurred within 24 months. In contrast only 25% of those who were hTERT negative and had no tumor at cystoscopy recurred within 24 months. The same tendency was found for MCM5. Fifty-six percent (9/16) of the positives (at first analysis considered false positive) recurred shortly after urine sampling and when we considered the disease course in the data analysis, they ended up as true positive. Univariate Cox regression analysis also showed that both hTERT and MCM5 were significantly associated with recurrence free survival (hTERT: HR = 4.6, p < 0.001; MCM5: HR = 2.7, p = 0.03). None of the risk factors for recurrence (i.e. previous stage, grade, size, multiplicity and CIS) were significantly associated with recurrence free survival in this group of patients. Multivariate Cox regression analysis showed that hTERT and MCM5 were independent prognostic markers for recurrence free survival when stratifying for previous grade, multiplicity and CIS (hTERT: HR = 8.5, p < 0.001; MCM5: HR = 4.2, p = 0.02). No other variables were significantly associated with recurrence free survival in the multivariate analyses. The lack of association between the risk factor for recurrence and the later tumor recurrence events is probably observed because of the limited number of urine samples included in this analysis (non-recurrent visits only). Recurrence-free survival estimates. Kaplan-Meier plot of recurrence-free survival for hTERT (N = 65) (A) and MCM5 (N = 47) (B) alone and in combination with cytology (C and D). E: Kaplan-Meier plot of recurrence-free survival based on cytology results. Only urine samples from patients with no cystoscopy detectable tumors are included. Finding a way to diagnose bladder cancer recurrence using a urine marker has been a major challenge in many years. Here we aimed at making a simple test useful on urine samples from every patient. A cross section of patients was used from the clinic disregarding large differences in disease courses and earlier treatment. The most well characterized marker in this study was hTERT. The urine expression has been studied previously and impressive results with sensitivity levels of 92% and specificity of 96% have been reported. In contrast to this study, the patient population consisted only of untreated bladder cancer patients in which a higher RNA concentration was expected in the urine  and thereby a higher detection rate . A urinary marker also needs to be insensitive to benign conditions like infections and cystolithiasis. Melissourgos et al. used a control group of 128 non-bladder cancer patients; false positive cases of hTERT detection occurred in persons with benign prostate hyperplasia or cystolitiasis . Cytology has an equivalent false positive rate, but the false positives were associated with bladder inflammation . Surprisingly, hTERT mRNA is not detected in cases where lymphocyte inflammation is present, since telomerase enzymatic activity is up regulated in activated lymphocytes. However, this enzymatic up-regulation may just be a transient effect [6, 8]. Another large study of hTERT and hTR in urine of 465 subjects in three different groups, bladder cancer, benign urologic conditions and healthy controls has been conducted by Weikert et al. . Previous studies reported sensitivity between 55.2- 91.8% and specificity between 85-96.1%. We observed a comparable sensitivity of 62%, but the specificity of 84.1% is a little lower [6, 7]. This could be due to the high number of low-grade Ta tumors in this study. The data presented here gives hope for a non-invasive test able to improve the current diagnostic regime, but there are some problems when working with urine RNA, as it is highly degradable and variation in cell content is large. We compared the RNA concentration in the different samples and found a significant difference, when comparing the primary group, the recurrent group and the non-recurrent group. The primary group had a much higher amount of RNA as compared to the other groups. The non-recurrence and recurrence groups are rather similar in RNA concentration. Van Rhijn et al. reported lower biomarker sensitivity in patients who are under surveillance for bladder cancer compared to a cross sectional sampling of primary and surveillance patients, while their specificity was not influenced . In accordance with our results the sensitivity increases with higher tumor grade. Okumura et al. 2004 found the opposite correlation between hTERT and tumor grade and suggested an alternative mechanism that can immortalize cells . SENP1 in our study was included based on the same theory, since it is known that in certain cancers maintain their telomeres by a telomerase independent mechanism known as alternative lengthening of telomeres (ALT) [27, 28]. We examined the possibility to increase the test using a molecular marker for ALT in conjunction with expression of hTERT. SENP1 might serve as such a marker. We found that SENP1 was positive in hTERT negative samples. Unfortunately diagnostic power of the combined analysis did not increase compared to hTERT alone (Additional file 4). With hTERT we should in theory have a marker unique to tumor cells; while gaining telomerase function they become immortal and insensitive to the normal senescence and apoptosis signal. Normally, hTERT is not seen in normal cells apart from germ- and stem cells. SENP1 was included as a potential marker of alternative lengthening of telomeres in the hTERT negative, but immortalized cells and it was a significant biomarker in our study. MCM5 has been characterized as highly expressed in high grade tumors. Telomerase has been suggested to be present in low grade tumors and these two markers should, in theory, complement each other. However, we did not observe an increase in accuracy of the markers when combined. In conclusion, the investigated candidates are promising but all have a lower specificity than cytology. They have a better sensitivity, and a combination with cytology may be an alternative to existing methods. We thank Gitte Høj, Hanne Steen, Inge-Lis Thorsen, Karen Bihl, Gitte Stougaard and Conni Sørensen for excellent technical assistance and the staff at the Departments of Urology, Molecular Diagnostics, and Pathology at Aarhus University Hospital. Grant support: John and Birthe Meyer Foundation, the Danish Cancer Society, the Ministry of Technology and Science, and the Lundbeck Foundation. Furthermore, the research leading to these results has received funding from the European Community's Seventh Framework program FP7/2007-2011 under grant agreement n° 201663. Cherie Holcomb is an employee Roche Molecular Systems, Pleasanton California; Roche Molecular Systems is a funding supporter. ASBE and KZ reviewed the patients' history and pathological data, performed sample selection and retrieval, carried out the molecular analyses, performed data analysis and part of the statistical analyses, interpretation of data. ASBE drafted the manuscript. HT collected the urine samples, and optimized the methods used. PPM, CH and FM participated in the method selection and interpretation of data, and MB was responsible for the clinical database. TFØ, CH, RH, HT and LD participated in the conception and design of the study, and critically revised the manuscript. LD supervised the analysis and interpretation of the data, and helped to draft the manuscript. All authors read and approved the final manuscript.